Dustin Johnson burned the edges. 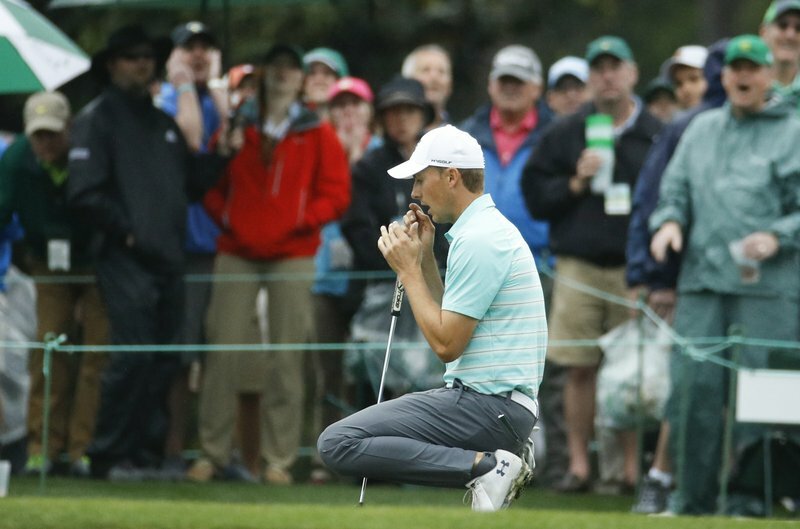 Jordan Spieth lipped out more than his fair share. Justin Thomas just never got comfortable on the greens. Three of the world’s best golfers blamed putting woes for being mostly stagnant on Moving Day at the Masters on Saturday. [post_ads]With everyone else around them moving up the leaderboard, Johnson, Spieth and Thomas didn’t keep pace. And they had a similar culprit: The putter, arguably the most important club on Augusta National’s treacherous greens. Johnson and Spieth each shot 1-under 71 in the third round. Thomas was one stroke better (70) and moved to 5 under heading into the final round. Their body language on the greens told the story. They leaned left. They leaned right. They begged a little and pleaded a lot. They shook their heads, swung their putters through the air and walked off in a huff more often than not. Now, all them are considered long shots to win golf’s first major of 2018. Third-round leader Patrick Reed is 14 under , three shots ahead of Rory McIlroy and five ahead of Rickie Fowler. “I get to go out for one of my only stress-free rounds that I’ve ever really played at Augusta National,” Spieth said. Spieth looked like he had solved his putting woes last week at the Houston Open and then again Thursday when he opened with a 6-under 66 that gave him a two-stroke lead after the first round. But the 2015 Masters champion and two-time runner-up (2014, 2016) failed to adjust to the speed of the greens Saturday and had too much pace on too many. After needing just 24 putts in the opening round, the 24-year-old Texan had nine more in the third. Spieth skirted edges on Nos. 2 and 3, missing birdie putts on consecutive holes and providing an early indicator of his round. Johnson knows the feeling. Ranked No. 1 in the world, Johnson had one huge mistake all day: A double bogey on the par-4 11th after driving way left into some bushes. The only other difference between making a bunch of birdies on a course ripe for low scores was those pesky putts. He has no plans to adjust, either. Thomas didn’t have the same touch. The 24-old-old Kentucky native and the PGA Tour’s reigning player of the year hit 17 of 18 greens in regulation — better than Reed or McIlroy in the third round — but needed 34 putts to shoot 2 under.